What is Brasanoide – BR 120? 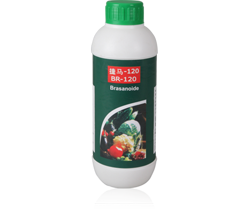 BR 120 is plant growth regulator, it is polyhydroxy steroids. works independently to increase cell division process. How BR 120 helps plants to grow better and yield more? It is used to increase the diameter, weight and size of fruits. When used in combination with gibberlic acid it gives best results. As a result of BR 120 application cell wall expansions take place. BR 120 increase photosynthesis activity. This keeps fruits green. BR 120 can hasten the growth of plant and hence increase yield. BR 120 makes the plant resistant towards drought and cold. BR 120 makes the plant resistant towards disease and stress. BR 120 When used in tissue culture, it can accommodate differentiation of injured tissue. As a result of research on many crop plants in more than 20 countries, it was found that BR 120 could improve the production of wheat, rice and corn upto 15–30%, fruit 15–45%, vegetables 20-50%, corn and other oil plants 20-30%. Its effect on production is notable. BR 120 is known as the best potential promoter all over the world. Improve the energy of seed; facilitate the growing of root and the early growing of plant. Through experiments it is clearly established that the young plant of capsicum grows 20-45% higher than unsprayed plants. BR 120 increases the output and improves the plant quality. BR 120 improves the capability of bearing cold. Reduces the pesticide injury, within 6 – 10 days and the plants can completely release itself from pesticide shock and resume growing. Increases the ability to resist disease, eg. Blast, leaf spot and virus diseases. Increases the ability to resist drought. Fresh roots come out in a few days after being sprayed. The original root will become white and will go down as deep as 10 cms. Even in draught seasons increased yield was noted. BR 120 some melon seedlings died. Ability to resist salt and salinization. Fruit Crops (Pomegranate, Mango, Citrus): 100 ml in200 litres of water.